Seca makes routine work easier for doctors, nurses and other caregivers. The seca 727 does just that – by giving them a highly flexible, wireless user experience. Its state-of-the-art weighing technology is now accurate down to a single gram and features a special damping system, making weighing fast, safe and precise. You can even unplug it and use it anywhere with its rechargeable battery power supply. The damping system ensures fast and precise measurements - A baby can certainly be fidgety while being weighed, but this is no problem with the seca 727. Even if the baby is moving and starts to wriggle around, the scale delivers precise measurements within seconds thanks to its highly sensitive weighing technology. Its optimized damping system levels off any vibrations caused by the baby’s movements, enabling medical staff to concentrate completely on the weighing process. Comfortable and reliable weighing process. - The large weighing tray makes the baby feel safe and secure. Its generous size even allows small children of up to 44 lbs to be weighed easily in a seated position. Made of a special plastic material, it quickly adjusts to the body temperature, giving the baby a sense of comfort. A new backlit LCD display ensures comfortable reading of the digits, even in dimmed rooms. Reading becomes easier than ever due to the auto-HOLD function. It freezes the measurement result on the display for five minutes with battery operation and endlessly with power supply. Medical staff can then take care of the baby before reading and recording the weight. Paperless and error-free wireless transmission of measurements. 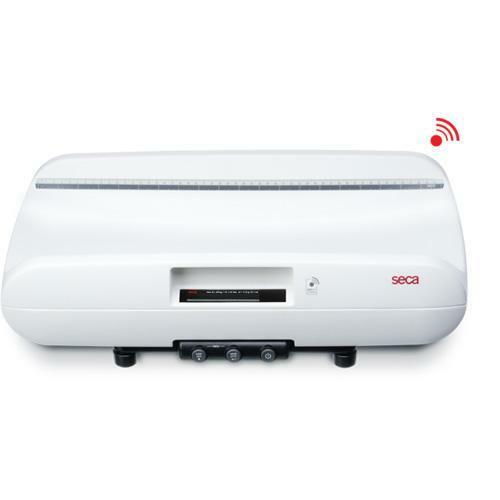 - With the seca 360° wireless technology, the seca 727 can transmit measurements to the optional seca 360° wireless digital printer. With the network-capable software solutions seca analytics 115 or seca emr flash 101 and wireless USB adapter seca 456, your PC can receive and analyze measurements and forward them to an Electronic Medical Record (EMR) system. The seca 727 is EMR-integrated, ready to handle digital patient records and all the demands the future will bring. Product Dimensions: (HxWxD) 6" x 21-1/2" x 11-3/4"
21.7 x 5.9 x 12.6"
The Seca 462 is a sturdy cart with locking wheels for use with all Seca baby scales. The cart is especially well-suited for the Seca 727 and Seca 728. The seca 402 cart is the ideal addition to seca baby scales. It was specially developed for safe and hygienic routine use in hospitals and medical practices. Customized indentations on the surface accommodates the scale’s base and ensures the scale does not slip out of place. Two practical brakes keep the cart securely locked in place so babies can be weighed safely. Also, you can quickly move the baby scale to it’s required location by pushing or pulling the cart by its handle. Compatible with seca baby scales (seca 727, seca 728, seca 374, 334, 354). The seca 403 cart is the ideal addition to seca baby scales. It was specially developed for safe and hygienic routine use in hospitals and medical practices. Customized indentations on the surface accommodates the scale’s base and ensures the scale does not slip out of place. Two practical brakes keep the cart securely locked in place so babies can be weighed safely. Also, you can quickly move the baby scale to it’s required location by pushing or pulling the cart by its handle. Compatible with seca baby scales (seca 727, seca 728, seca 374, 334, 354)..